There’s never been a better time to earn your analytics degree, and you can achieve it with us in as few as 24 months. The proliferation of social media, smart technologies and the Internet allows organizations to capture more quantifiable data than ever before. However, collection of this raw data alone does not produce the meaningful insights needed to make strategic business decisions. Instead, it’s the detailed analysis of this data by experts that unlocks its true value. Recognizing these trends, the Villanova School of Business (VSB) has designed the online Master of Science in Analytics (MSA) to develop business analytics leaders. At Villanova School of Business, we recognize that today’s business decisions must be data driven — and that organizations need individuals with expertise in both areas who can bridge the gap between these two worlds. Our program equips you with the skills needed to not only collect and analyze data, but to transform it into actionable intelligence that will give you and your organization a competitive advantage. Unlike other programs which combine classes from existing degrees, our analytics curriculum is custom designed to meet current business needs. With guidance from senior business executives and faculty members on our Center for Business Analytics Advisory Board, each course in our curriculum addresses the skills that industry most urgently needs. The result is a comprehensive curricular approach that addresses the whole continuum of business analytics — from data collection and analysis through implementation and application. With coursework that addresses data management, business intelligence, predictive and prescriptive models and their application across all business functions, our program can prepare you to succeed across the analytics spectrum. The program’s capstone project enables you to partner with an organization to solve real-world problems and graduate with industry-ready experience. It is supported by the Center for Business Analytics, one of Villanova School of Business’s six Centers of Excellence. The Center is governed by an impressive group of industry executives from such companies as Exelon, PPL, Bank of America, IBM, Macy’s, Aramark, SAP, Wyeth Nutrition (Nestle), North Highland, Campbell Soup, Harrah’s, PricewaterhouseCoopers and Janssen Healthcare Innovation (Johnson & Johnson). 1. Graduate in as few as 24 months and learn 100% online. 2. Earn your degree from an AACSB-accredited business school. 3. 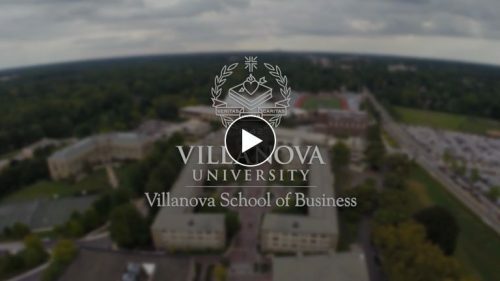 Tap into the industry connections and career placement opportunities offered through the Villanova School of Business Center for Business Analytics, one of the few such centers in the nation. 4. Benefit from an applied, skills-based curriculum designed to help you utilize data to drive business decisions. 5. Partner with an organization on a real business analytics capstone project. 6. Learn from industry-experienced faculty whose ideas are shaping the future of business analytics. 7. Take advantage of the opportunity to learn in small classes with approximately 20 students per online section. 8. Join a university with a vast global alumni network. 9. Cultivate strong relationships with highly talented peers. 10. Add a respected credential from a renowned institution to your resume and it could lead to greater opportunities, salaries and advancement. Analytics has transformed the business world. Technology has also revolutionized the way business education can be delivered. That’s why our Master of Science in Analytics program is expertly designed to deliver the complete Villanova educational experience in a highly interactive online format. The flexibility and convenience of this innovative approach allow you to earn your degree while simultaneously balancing the demands of work and life. An advanced degree in analytics from Villanova can equip you with the expertise to help your organization stay one step ahead of the competition — now, and into the future. The renowned faculty of Villanova School of Business’s analytics program is composed of the very analytics experts currently defining the future of the profession. This is your opportunity to learn from some of the best and brightest minds in business, analytics, computer science, statistics and mathematics. Our analytics degree is a 36-credit hour program. You can earn your degree in as few as 24 months. Our analytics degree consists of 11 foundation and core courses plus an application-based practicum project in the final capstone course. Each semester in the program is divided into two terms. Complete one or two courses per term and you can finish in as few as 24 months. Our students work with leading statistical analysis software. Contact an enrollment advisor to learn more about the cutting-edge tools we utilize. Since technology is always advancing, our goal is to teach you techniques that you can apply using a variety of software packages. This way, as technology becomes more sophisticated, so does your skill set. Analytics experts are in high demand in nearly every industry all over the world. In fact, a recent McKinsey report projects that by 2018 there will be “a shortage of 140,000 to 190,000 people with deep analytical skills as well as 1.5 million managers and analysts (needed) to analyze big data and make decisions based on their findings.” As you can see, there is no shortage of opportunity — only talent. We place a lot of emphasis on delivering a personalized education — from the way our courses are designed to our faculty’s commitment to maintaining virtual office hours. We design our courses based on a cohort model so you will typically progress through your program with the same group of students, getting to know your peers personally as well as professionally. As an online MSA student in the Villanova School of Business, you can become part of a distinguished and supportive learning community and active alumni network. Each course has a blend of asynchronous and synchronous components providing opportunities to directly engage with faculty and fellow students. And class sizes are purposely small to encourage participation and enhance the value of peer-to peer learning. ANALYTICS IS CONTINUALLY EVOLVING. SO ARE OUR FACULTY LEADERS. What does it take to prepare students to be leaders in this cutting-edge industry? It takes cutting-edge leaders. Our faculty members are nationally recognized experts in business, analytics, computer science, statistics and mathematics. We understand the intersection of data and business and the skills needed to drive smart and sustainable decisions, remain competitive and optimize performance. Our commitment to our students and passion for teaching lies at the heart of our mission dedicated to developing successful business executives and first-class global leaders.